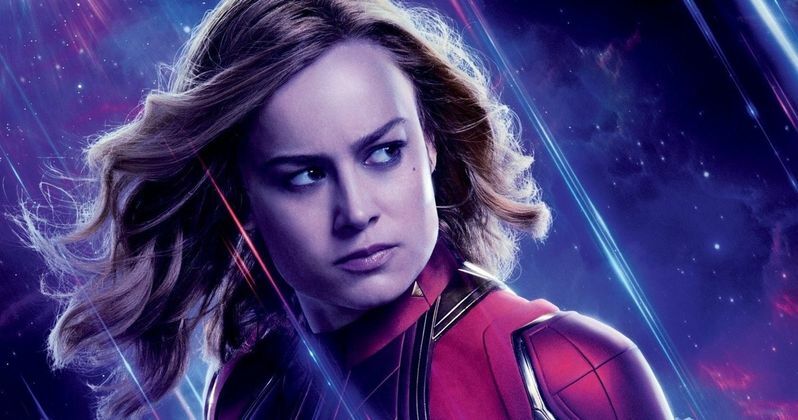 When the full-length Avengers: Endgame trailer arrived, many were wondering why Brie Larson's Captain Marvel was looking different. Specifically, why was her character wearing makeup with a very different hairstyle? Carol Danvers wasn't wearing nearly as much, if any, makeup in Captain Marvel, which seemed to suit the attitude of the character rather well. Yet, in the upcoming sequel to Infinity War, she's got a new style. But directors Joe and Anthony Russo have an explanation. Many online weren't happy with the change in her looks. The Russo brothers were accused of putting Captain Marvel through their 'male gaze'. It's important to note that Ryan Fleck and Anna Boden directed Brie Larson's recently released standalone feature, which provided a female filmmaking presence behind the camera. In a recent interview, Joe Russo explained that they actually let their actors decide on their looks for the movies themselves. Here's what he had to say about it. "We give all the actors ownership over there... Every hairstyle that Scarlett Johansson has had and every movie that we've done has come from Scarlett Johansson." He explained that they set the parameters..".in terms of what we need." But beyond that, it's largely up to them. So Brie Larson and her hair and makeup people chose to make Carol Danvers look that way. And there's a good reason for that. Joe Russo further explained that the actress actually shot Avengers: Endgame first, which means she didn't quite have the firm grasp she has on the character now. "This was Brie's first time playing the character. She [filmed Avengers: Endgame] before she filmed Captain Marvel, and I think she was experimenting with what the character was. And those were the choices that she and her hair and makeup team had made. And I think as she started to gain a deeper understanding of the character, especially as she approached her own movie. She started to make different choices and as an artist she should be afforded that right to make whatever choice that she wants to make." So there we have it. It's also important to note that Captain Marvel takes place in the 90s. That means more than two decades will have passed between the last time we saw her, chronologically speaking, and when she joins the remaining heroes on Earth in Avengers: Endgame. Anyone's looks can change quite a bit over the course of more than 20 years. Like it or not, it's an important distinction that this was Brie Larson's choice. The makeup and hairstyle weren't pushed on her by the Russo brothers. Surely, we can assume of Larson had the understanding of her character that she has now, things might have been different. In any event, it will largely come down to how the character is executed on screen alongside the Avengers, as well as the story being told. If that all falls in line, it may be easier to overlook the lipstick. Avengers: Endgame is set to hit theaters on April 26. This news was first reported by Slash Film.